The PASSCLAIM Consensus Document contains consensus criteria on a pan-European level to assess the scientific support for claims on foods, and was widely disseminated among scientists, industry, consumer groups and regulators. The PASSCLAIM Consensus Document assists those making and regulating claims. PASSCLAIM provides consumers with the assurance that claims are well founded and justified. EFSA referred to PASSCLAIM in its draft opinion on scientific and technical guidance for preparation and presentation of the application for authorisation of a health claim. In order to meet the project objectives, a European network was set up involving academic experts in different aspects of the physiological functions relating to health claims, representatives of public interest groups, regulatory experts and the food industry. Initially, four “Phase One” Individual Theme Groups (ITGs) were set up. ITGs A, B and C focused on three physiological areas, namely Diet-related cardio-vascular disease (A), Bone health and osteoporosis (B) and Physical performance and fitness (C). assess the usability of the markers (and their validation) used for the scientific substantiation of the claims. ITG (D) review of existing processes reviewed the current global situation in terms of schemes to regulate claims and other similar systems and concepts which are universally applied. The report from ITG (D) was made available to ITGs A, B and C while they were drafting their reports. As a consequence ITG A, B and C were aware of the global background as they were making the selection of criteria which are appropriate for their particular physiological theme. Publication I contains the reports of “Phase One” ITGs (A to D) and a first draft set of interim criteria agreed by the First Plenary Meeting. The draft set of interim criteria as published in Publication I was used by four new “Phase Two” theme groups, concerned with insulin sensitivity and risk of diabetes (E), diet-related cancer (F), mental state and performance (G) and gut health and immunity (H). Like the “Phase One” ITGs, the “Phase Two” ITGs elaborated, in key areas for the development of enhanced function or reduction of disease risk claims, a “blueprint” for what needs to be done in terms of scientific research and how claims should be justified. The “Phase Two” theme groups will review and test how the interim criteria can be used in the different physiological areas. They then positioned their criteria with the draft set of interim criteria and produced a draft set of wider new criteria as necessary. A draft set of wider criteria were then be obtained from the Second Plenary Meeting and were published in Publication II together with the reports of ITGs E to H. This technique of reflective practice and continuous improvement broadened and refined the set of criteria and ensured that many possible methods for the scientific substantiation of claims were considered. This enabled the final PASSCLAIM Consensus Document to contain consensus criteria derived from a very broad basis and ensured its wide applicability. 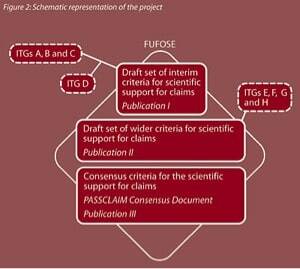 The Consensus Group then used the outcome of the ITG and Plenary Meetings (Publication I and II) to propose draft consensus criteria for the scientific substantiation of claims. 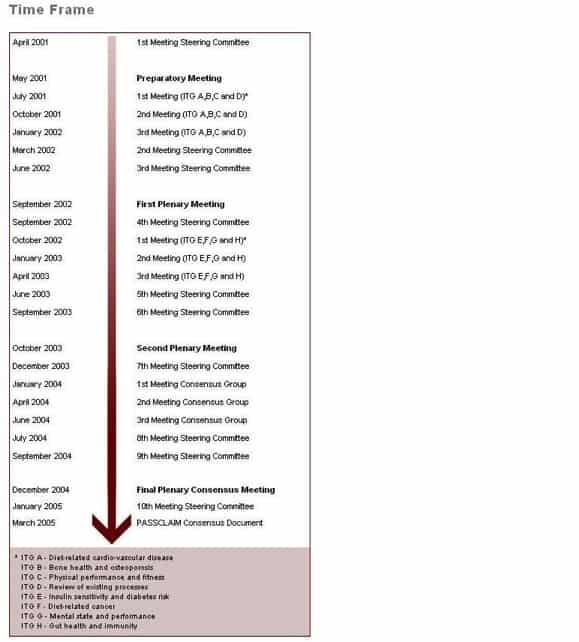 These were agreed by the Third Plenary Meeting and published in the PASSCLAIM Consensus Document, Publication III. The consensus criteria were widely disseminated among the scientific, industrial, regulatory and consumer communities. PASSCLAIM offers a practical scientific framework to prepare scientific dossiers supporting claims. This framework ensures that all claims have a firm scientific base. European food manufacturing industry, including SME’s, benefit because of the competitive edge that has been provided. PASSCLAIM enables the compilation of guidelines to prepare submissions for claims on foods. This expedites and improves the efficiency of the regulatory review processes. Consumers benefit from an improved approach to the scientific support for claims on foods. This integrated strategy generates more consumer confidence in the science base related to claims on foods and better addresses the concerns of consumers. Click here to download PASSCLAIM ITG A on diet related cardiovascular disease by Mensink et al. Click here to download PASSCLAIM ITG B on Bone health and osteoporosis by Prentice et al. Click here to download PASSCLAIM ITG C on Physical Performance and Fitness by Saris et al. Click here to download PASSCLAIM ITG D on Synthesis and review of Existing Processes by Richardson et al. Click here to download PASSCLAIM – Report of the Second Plenary Meeting including a set of interim criteria to scientifically substantiate claims on foods by Cummings et al. Click here to download PASSCLAIM ITG E on Body weight regulation, insulin sensitivity and diabetes risk by Riccardi et al. Click here to download PASSCLAIM ITG F on Diet-related cancer by Rafter et al. Click here to download PASSCLAIM ITG G on Mental state and performance by Westenhoefer et al. Click here to download PASSCLAIM ITG H on Gut health and immunity by Cummings et al.